Congratulations to Noel Gallagher’s High Flying Birds, who land straight in at Number 1 on the Official Albums Chart with their new album Who Built The Moon? 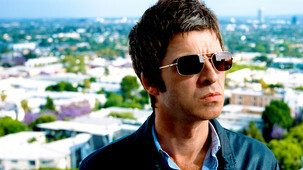 Noel and his High Flying Birds’ third album shifted 78,000 across physical, downloads and streaming equivalent sales to take the top spot. 76% of the record’s sales this week were from physical CD or vinyl purchases. NGHFB now claim a hat-trick of Number 1 records, following 2011’s self-titled and 2015’s Chasing Yesterday. Including Oasis’ discography, it’s Noel’s tenth chart-topping studio album (eleventh including Oasis’ 2010 greatest hits Time Flies). "I’d like to say thanks for giving it a chance," Noel told OfficialCharts.com. "I was convinced from the outset that the people who bought it would love it – not like it, they’d love it – and that seems to be the case."